of living love and mortal pain. The Lays of Beleriand is the third volume of The History of Middle-earth and it consists of two extensive poems by J.R.R.Tolkien having to do with the Eldar Days. They are the Lay of the Children of Hurin and the Lay of Leithian. The Lay of the Children of Hurin was written between 1920 and 1925, while the Lay of Leithian was composed, in turn, from 1925 to 1931. Both poems were eventually abandoned by Tolkien and only the Lay of Leithian was re-visited by the Professor in 1949 or 1950 when he virtually re-wrote it. It is the new, or revised, poem that we see in this text. It is a particular joy to read the easy flow of words in the beautiful Lay of Leithian, especially if the reader has just slogged their way through both volumes of The Book of Lost Tales. 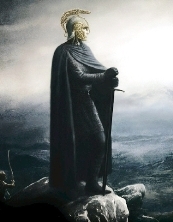 The Lay of the Children of Hurin: This first epic poem is primarily concerned with the story of Turin, son of Hurin. He is fostered by Thingol Greycloak, reminiscent of the fostering of Aragorn by Elrond thousands of years later. Thingol was the greatest King of the Eldar in Middle-earth and the father of Luthien Tinuviel just as Elrond was the father of Arwen Undomiel. The Lay of Leithian: In the second epic poem of the book, we read the very detailed, yet totally glorious story of the Man and the Elf Maiden who literally started it all. Their meeting, their falling in love, their trials and tribulations which seem to come from every corner of Middle-earth are beautifully brought to life in rich and resounding poetry that will leave you without a doubt that Tolkien was indeed a Master of the English language, and an extraordinary weaver of mythical tales. This is vintage Tolkien at his very best.